We have some outdoor living space ideas to share with you from Tracy Porter. 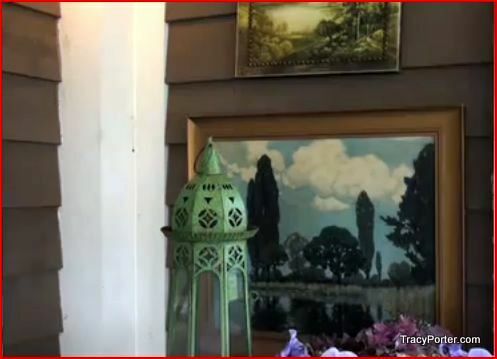 Tracy's videos are fun to watch - she's elegant and yet very down-to-earth at the same time. 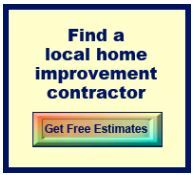 Dave and I enjoy Tracy's ideas and we want to share them with you. Outdoor living today is much like years ago. Bring the inside out and make a comfortable space outdoors that reflects how you like to live indoors: comfortable, functional with some splashes of fun. 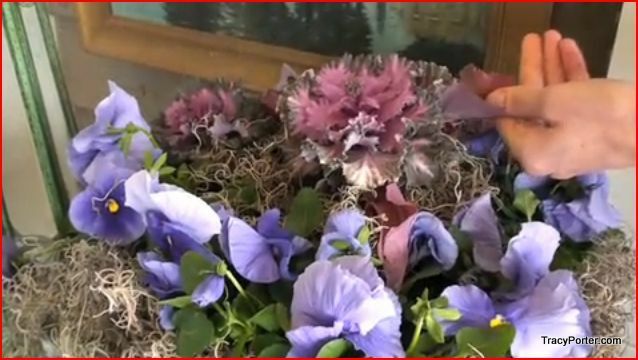 Tracy Porter's videos have some refreshing thoughts on how to make your outdoor space a place you long to enjoy. 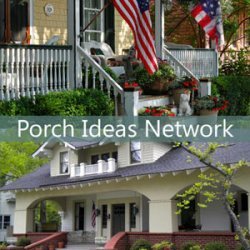 Tracy, her hubby and four boys practically live on their porch in the summer, so she brings you fun and practical ideas. 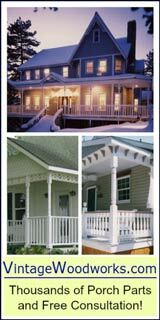 Whether you have a porch, a screened porch, deck, patio or any kind of outdoor space, make it comfortable. 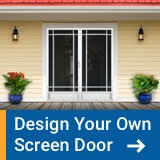 Make it livable like the way you live in doors. The more comfortable it is, the more you will want to spend peaceful times there. So here are Tracy's outdoor room ideas from the video. 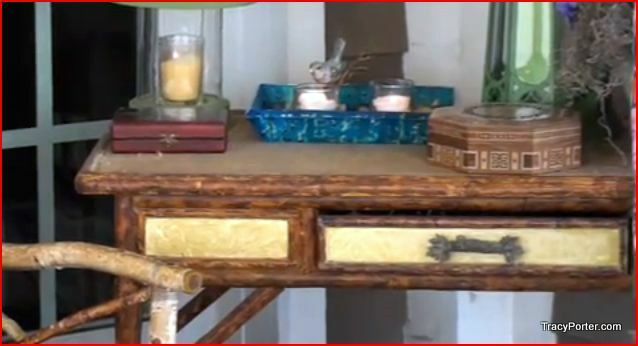 Tracy brought a bamboo desk from inside her home to her porch. 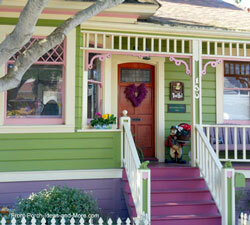 It gives her porch a cottage kind of feeling. 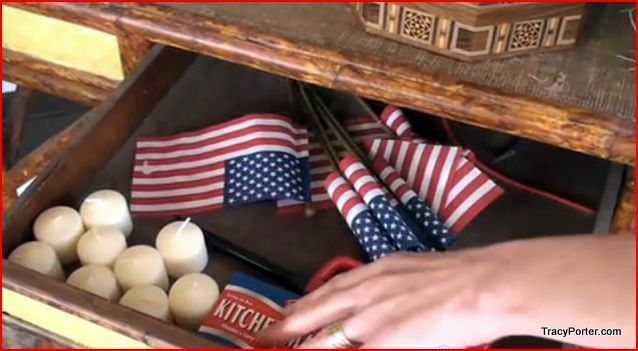 See the useful items Tracy keeps in the desk: candles, matches and flags. Other ideas are a crossword puzzle book, a tablet and some pencils. 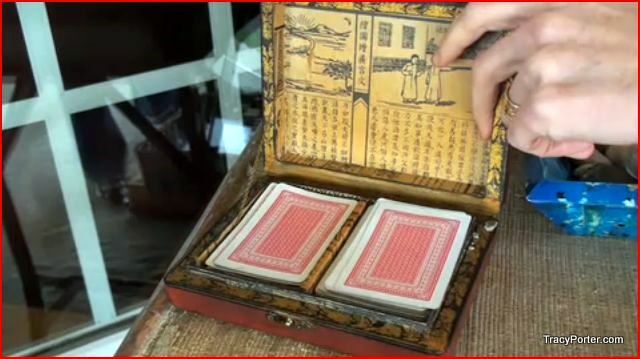 Playing cards, dice and board games are always fun for your outdoor room. Keep them handy for when your family wants to play. 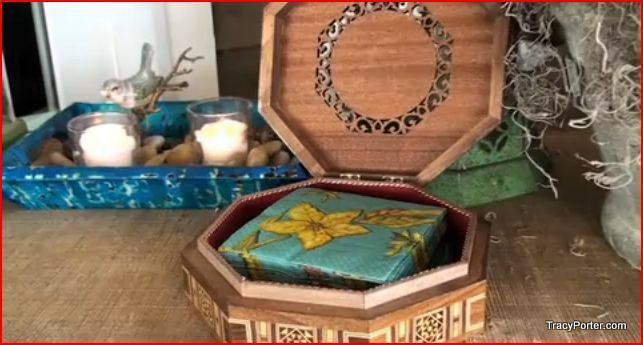 Pretty napkins in an elegant box - very "Tracy Porter". Maybe tuck in some coaster or a box of tissues. She included some sweet and personable items like this colorful green lantern and bright blue dish. Take a closer look. 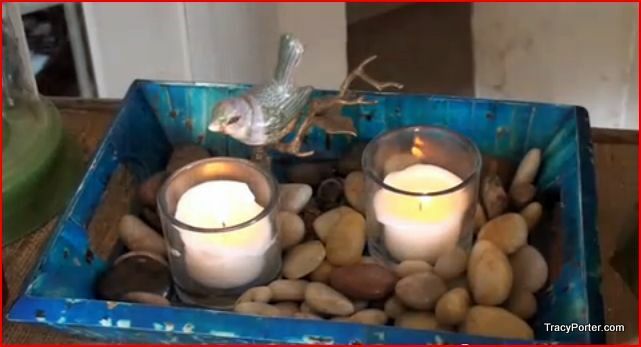 The blue dish is filled with river rocks, a couple lit candles and a memorable little bird. 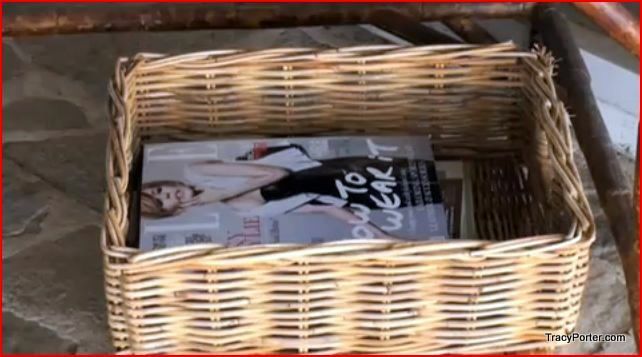 A basket of magazines, paperbacks or kids' books is nice to keep handy. Colorful pillows and a soft throw make this a nice spot to sit - even on chilly mornings or evenings. Tracy hung attractive artwork on the wall. A mirror would work, too. Or perhaps you have a collection to hang. Bring some nature to your porch. Tracy planted pansies and kale in this pot. Neat combination, don't you think? 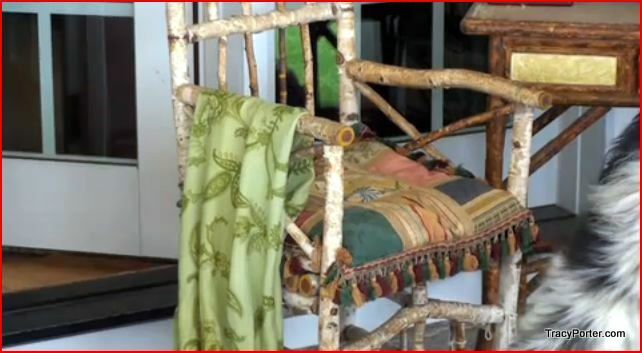 In this video, Tracy talks about how she makes her porch comfortable with simple furnishings. Chaise lounges are classic pieces of outdoor furniture. 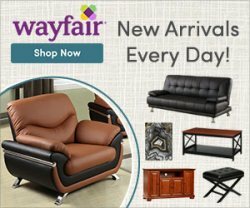 Tracy says to make them "yours" with your personal choice of cushions, pillows and soft throws. 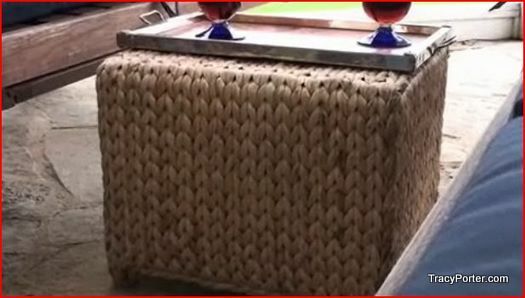 Tracy even has an antique rug on her porch (which she moves when it rains). And notice the lovely basket of primroses. Tracy loves ottomans for cozying up her porch. They come in many styles and textures - this one is needlepoint. 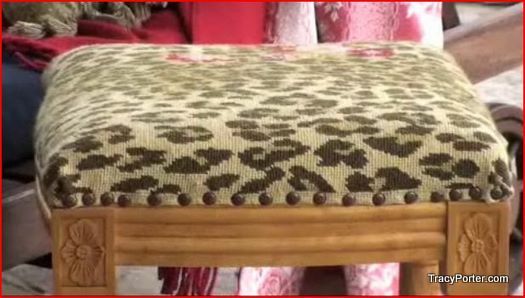 Tracy loves this funky ottoman with a leopard print. 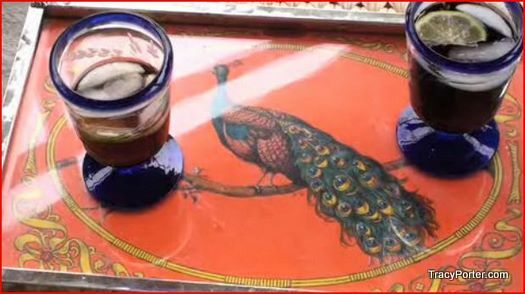 An eye-catching art deco tray in bright orange. Do you think it's also fun? 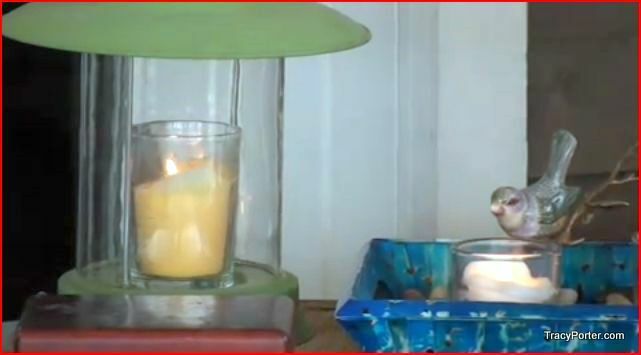 We hope that Tracy's videos gave you some fun outdoor living space ideas - for your own porch. 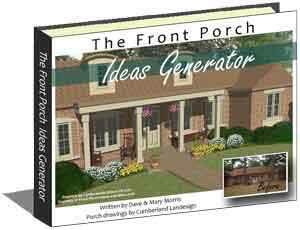 Like her, we hope you bring some "calm" to your porch so that your have an outdoor room in which to totally relax. 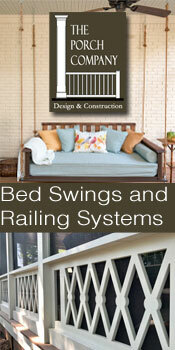 See our section on Outdoor Room Ideas too! Tracy Porter is a fun, creative and elegant mother of 4 boys - and a designer of clothing, shoes, jewelry and home decor. She loves porches like we do. Love pets? 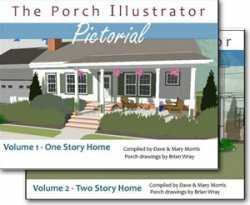 See our porch dogs and porch cat pictures.